a fluid largely secreted by the choroid plexuses of the ventricles of the brain, filling the ventricles and the subarachnoid cavities of the brain and spinal cord. The serumlike fluid that circulates through the ventricles of the brain, the cavity of the spinal cord, and the subarachnoid space, functioning in shock absorption. Also called spinal fluid. the fluid that flows through and protects the four ventricles of the brain, the subarachnoid spaces, and the spinal canal. It is composed mainly of secretions of the choroid plexuses in the lateral ventricles and in the third and the fourth ventricles of the brain and is clear and colorless. Changes in the carbon dioxide content of CSF affect the respiratory center in the medulla, helping to control breathing. 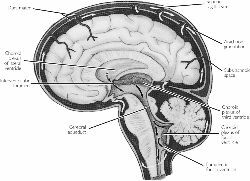 A brain tumor may press against the cerebral aqueduct and shut off the flow of the fluid from the third to the fourth ventricle, causing fluid accumulation in the lateral and third ventricles, called internal hydrocephalus. Other blockages of the flow of CSF, such as those caused by blood clots, result in serious complications. Certain illnesses and various diagnoses may require microscopic examination and chemical analysis of CSF. Samples of the fluid may be removed by lumbar puncture between the third and the fourth lumbar vertebrae or from the cisterna magna. Spinal fluid Neurology A clear, colorless fluid that contains small quantities of glucose and protein, which surrounds the brain, spinal cord, ventricles, subarachnoid space, and the central canal of the spinal cord, provides nutrients, and acts as a shock absorber; CSF analysis is accomplished by lumbar puncture; WBCs or bacteria in the CSF indicate bacterial–septic meningitis. See Lumbar puncture. 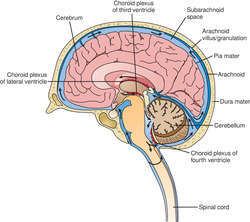 a solution secreted by the CHOROID PLEXUSES (one in the roof of each of the four brain VENTRICLES (2) in man) which fills the cavity of the brain and SPINAL CORD and the space between the CENTRAL NERVOUS SYSTEM and its ensheathing membrane. It contains most of the small molecules found in blood, e.g. salts and glucose, but little protein and few cells, and serves as a nutritive medium. In humans the total volume is about 100 cm3. Fluid produced within the brain for nutrient transport and structural purposes. CSF circulates through the ventricles, open spaces within the brain, and drains through the membranes surrounding the brain. n colorless, clear fluid that surrounds the central nervous system, that absorbs shocks, delivers nutrients, and removes waste products. n the fluid that flows through and protects the four ventricles of the brain, subarachnoid space, and spinal canal. Table-II: The comparison of the cerebrospinal fluid examination results between the two groups. Current management of cerebrospinal fluid rhinorrhoea. Management of cerebrospinal fluid rhinorrhea: The Medical College of Wisconsin experience. Spontaneous cerebrospinal fluid otorrhea from defects of the temporal bone: A rare entity? In an individual with hydrocephalus, cerebrospinal fluid enters the two lateral ventricles -- also known as the first and second ventricles -- and passes into the third ventricle through an interventricular foramen. The purpose of our study was to retrospectively assess the efficacy of both these treatment regimens, and to propose a treatment algorithm for the management of cerebrospinal fluid leakage following posterior cranial fossa surgery. For the supply of cerebrospinal fluid (CSF) drainage catheters, external collection and drainage systems and hydrocephalus therapy systems. They will also offer RNA capture from frozen, bio-banked fluids and the use plasma, urine and cerebrospinal fluid without requiring special stabilisation or handling. have used a new method to quantify soluble variants of aggregated beta-amyloid (amyloid-beta oligomers) in cerebrospinal fluid by flow cytometry. This paper described a dye-binding micromethod for measuring protein concentrations in cerebrospinal fluid and urine. In the July Nature Medicine, researchers describe a test that enables them for the first time to track amyloid-beta production and clearance in cerebrospinal fluid in people. 2 g/dL, and normal platelet count, and normal cerebrospinal fluid was seen by lumbar puncture.